I will also provide a compatibility CD that will allow the game to run under ALL VERSIONS of Windows 10, 8, 7, Vista and XP, both 32 and 64 bit. Note that multi-player mode is not supported by default. Local network multi-player is possible but I would require a little info about your computers. With 14 missions on the human campaign, the first 7 or 8 are desgined to ease you into the game. The difficulty increases such that you will be sorely challenged during the last couple of battles. The result is a superbly balanced game. SVGA graphics: Warcraft II increased screen resolution to 640x480 SVGA, compared to the first Warcraft's standard VGA. Aside from the sheer visual appeal, SVGA terrain and icons are easier to distinguish. Fog of war: I found this to be the most interesting improvement. 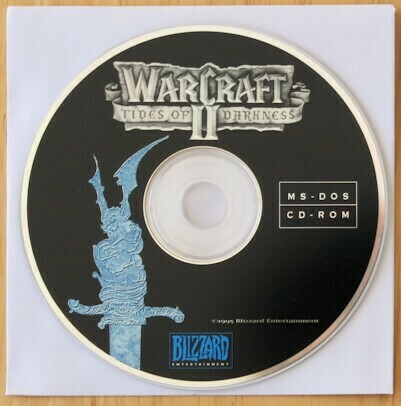 Unlike Warcraft I, in this edition you can only see what your units can see, so after exploring land you know the terrain but unless you leave a unit in a location you'll not see any enemy troop movements there. This makes planning more important (and airborne scouting units essential), and makes for great entertainment in multiplayer network games. If you wish, you can disable fog of war and just see all units in any land you've explored, regardless of sighting. Air and naval units: At first I didn't like this idea; while flying machines and balloons seemed feasible in the Warcraft game setting, oil refining did not. Yet after a short amount of playing the concept grows on you and you get used to it. Adding naval units and transports adds an excellent extra dimension to the game, especially with island-hopping multiplayer battles. In single-player campaigns the naval aspect isn't so hot, as the computer won't build huge fleets like you (should) do. Thus naval warfare isn't as challenging as it might be. The air units work very well with the fog of war rules - you need archers/axemen or guard towers to deter them. 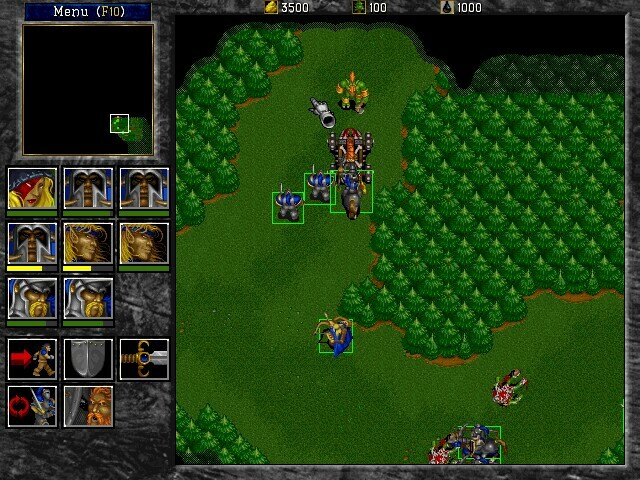 More control: In Warcraft II you can work with groups of up to 9 units rather than just 4. You can set patrol paths for units (between two endpoints, again works well with fog of war). You can tell units to stand firm when attacked, which you couldn't do in Warcraft I - your footmen would always charge the oncoming axemen when you didn't want them to. You can now also order catapults to attack a fixed location as a target. Further, a right click auto-orders your unit, so if you have a peasant selected and right-click a mine, he'll harvest it; if you have a footman selected and right-click an Orc, he'll attack it. Warcraft II shows unit health info to the side of the map rather than on it, that's only to be expected. 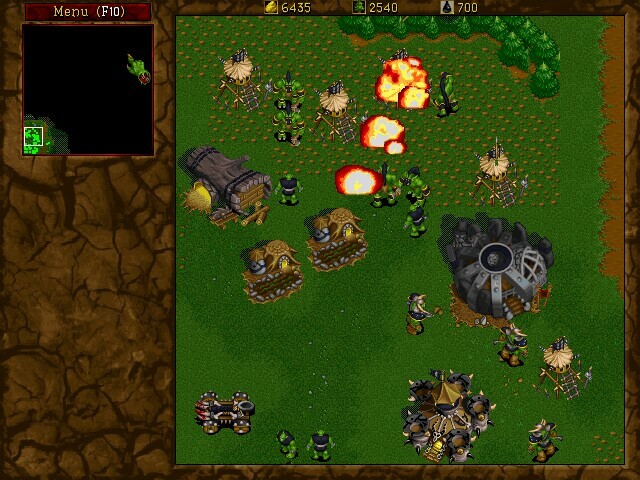 Remote building: Warcraft II has no roads, instead you can build anywhere. This is essential if you're building on a distant island, but also useful to speed up harvesting of a mine or wood by building a hall or lumber mill right next to it. Buildings are built on the map and are vulnerable to attack while being built - this deters you building too close to the enemy. You can't just pre-create a building and slap it on the map instantly. This makes for interesting tactics - you can for example build a barracks well away from your village in a more secretive location. Improved music and sound FX: The music is in fact quite stirring, as it was in the original. The digitized effects and speech are again excellent, and add well to the game atmosphere. Repeatedly clicking on the same unit several times gives amusing results. Of all the background tunes, the Conanesque Orcish one is my favorite. The editor is pretty much all you could hope for. You can build the map, place buildings and units, gold mines, oil wells, etc, and configure up to eight sides to play on it. It took me about 30 minutes to create a scenario that would play on a large map, and then about another 30 minutes to get comprehensively stuffed by the computer players. This is a good sign - if the campaigns are too easy you can give yourself or your friends a challenge with your own scenario. Difficulty can be set by how much gold you put in the mines, how close the mines are to the halls, and generally what sort of start you give to the computer players. If you remove resources you can have a straight wargame between two sides. You can set each side (or unit) to be active or passive in nature, and to attack by either land, sea or air. Passive armies are suited for little clusters of dragons or demons around gold mines.